Beetroot is a much maligned and generally underrated vegetable. It is incredibly versatile, given it’s sweet but earthy flavour, intense (and wide range of) colours and terrific texture, can be used from everything from chocolate beetroot cake to beetroot risotto, Super-nutritional sports drinks to ice cream. A number of high profile celeb chefs have been on a mission recently to raise the profile of this vegetable – Antonio Carluccio, Nigel Slater and Hugh Fearnley Whittingstall to name but a few have been promoting its virtues, at a time when it’s in season, and in my garden at least, this year has grown exceptionally well. So cast off your nightmare memories of the ’70s, when Beetroot were those slimy purple slices in jars which tasted of teeth-melting vinegar, and give Beetroot another chance! If time is shore, and the roots are of an even size and not too big, you can microwave them. This is a very effective method, although doesn’t develop the same intensity of flavour as roasting. Place the roots in a pyrex bowl with a splash of water and cover. Microwave for 5 minutes and remove. Test with a fork – if soft they’re done. If not, return for another couple of minutes. Steaming preserves the flavour really well, but can make a real mess of the steamer, so use with care! 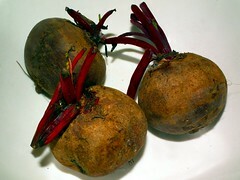 You now have your beetroot, cooked to perfection, peeled and ready use. Enjoy.